The songs on Tooth and Nail had their genesis in a comment that turned up in my twitter feed sometime in 2011. It said something like ‘Getting over break-up by listening to @billybragg, the Sherpa of Heartbreak’. It made me smile to think of my love songs doing some emotional heavy lifting for the heart-broken. Most people, when they hear my name, think of polemical anthems born in struggle. I often find myself having to remind people that I am also the Sherpa of Heartbreak, writing songs about the struggle to maintain our relationships with those we love the most. Since the release of my last studio album, Mr Love & Justice in 2008, I’d become rather disillusioned with the record industry, wondering if there was any place for a middle-aged Billy Bragg in a market dominated by the X-Factor. Plenty of people wanted to see me in concert, but was there really any point in me going into the studio for six weeks to record another album? Did I still have the appetite for such a huge undertaking? 2011 had started badly. My mother fell ill in January and passed away six weeks later. Such things force you to take stock, of where you are, what you’ve been doing, but most of all, what you want to do with the time you have left. The ‘Sherpa of Heartbreak’ tweet was a nudge, reminding me that I also write love songs. Driven by this impulse, I put in a call to my old friend Joe Henry. Joe and I go back a long way. I’ve admired his lyrical song writing since we first met in the Rockefeller Centre in New York sometime in the 80s. Over the years, I’ve watched admiringly as he extended his talents into the sphere of record production. We’d often talked about recording together, with Joe assuring me that making an album need not be a long drawn out process with an uncontrollable budget. But did I have an album of songs? Not really. I needed something concrete to focus my attention. That focus came when I made a commitment to Joe to come to his studio in January 2012 and make an album. Any ambiguities I might have felt were banished by my decision to fund the sessions myself. Joe assured me that we could make an album in his basement in five days. I wasn’t so sure. I hadn’t done anything like that since Life’s A Riot, my debut album 30 years ago. But the recording of Tooth & Nail proved to be very different from any album I had made. Firstly, I would be playing with a bunch of musicians that I hadn’t recruited myself. Joe assembled his regular crew in the basement of his house in South Pasadena, California, each one of them an amazing musician. Over in the corner was guitarist Greg Leisz, whose pedal steel I’d been enjoying on the Bon Iver album. Patrick Warren had just finished playing keyboards on Lana del Rey’s debut. In the drum booth was Jay Bellerose, fresh from recording with Regina Spektor and David Piltch had recently played his upright bass on the Grammy winning album that Joe produced for Ramblin’ Jack Elliot. Secondly, I sang the vocals as we laid down the tracks. Usually when recording, I sing a scratch vocal for the band to follow, which is later replaced by a more polished vocal that can sometimes take hours to get right. Received wisdom says that Billy Bragg isn’t a natural singer. Joe didn’t buy this. Instead, in a huge boost to my confidence, he encouraged me to perform each song as if it were definitive. As a result, the album is ‘live’ – we didn’t do any vocal retakes or overdubs, which is a first for me. Thirdly, we made the whole album in five days. It helped greatly that we were at Joe’s house. The atmosphere there was just so much more conducive to creativity than if we’d have been locked away in some sterile studio environment. Instead, things were very relaxed and, as a result, highly spontaneous. I’d teach the band a song, we’d run through it a few times, then go for a take. In the first two days, we recorded eight of the tracks on the album this way. And finally, I didn’t tell anyone that I was in the studio. By the time Joe and I agreed to make the album, my 2012 was already full of commitments. The Mermaid Avenue Complete Sessions, the Grammy nominated album of Woody Guthrie songs that I recorded with Wilco in 1998, was due to be re-issued with 17 extra tracks in the spring. I had dates booked in Germany and the US and tours planned for Australia and New Zealand. Telling everyone I was in the studio would have set in train a series of events aimed at getting my new album out as soon as possible. By going under the radar to make the record, I was able to spend 2012 celebrating the centenary of Woody Guthrie without having the added pressure of promoting a new album. 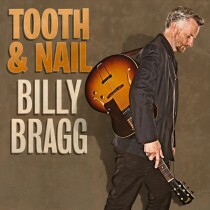 It is fitting that Tooth & Nail should be my next release after the re-issue of the Billy Bragg & Wilco collaboration as, stylistically, it is the follow-up to Mermaid Avenue that I never made. Back in 2000, responding to the troubling rise of the far right in Britain, my next album, England, Half English, addressed the politics of identity through a multicultural mix of musical styles. Tooth & Nail returns to the rootsy sound of the Mermaid Avenue Sessions, drawing on soul, country and folk music influences to explore the ups and downs of relationships that have stood the test of time. In 2011, I took a long, hard look at who I am and what I do. This album is the result.